You might have placed shortcuts of your frequently used application on your desktop for easier access. But then, to reach them you have to show your desktop. This might be a bit annoying if you have another application or window open. You will have to minimize all open windows to see your desktop and only then you can click on the shortcuts. Not a very "shortcut" method, isn't? So how to get around this? Enter Shock Desktop. Shock Desktop is a helpful little utility that performs two function. 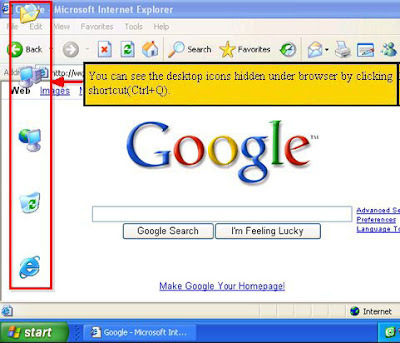 First, it allows you to arrange your desktop icons in any way you wish and then save the arrangement. Secondly, by using a keyboard shortcut it allows you to view the desktop icons by popping them up in front of the open window. The following screenshot will help you understand this function. Shock Desktop also lets you hide the desktop icons or the labels of the icons. In other words, it almost lets you play around with your icons at will.